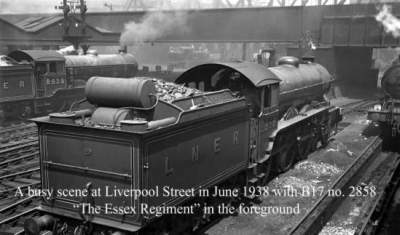 The Essex Regiment Locomotive was a B17 3 cylinder locomotive built for express passenger work by London and North Eastern Railway (LNER). Most of the series of B17 locomotives were names after country estates but two were names after Army Regiments- The Essex Regiment and the Suffolk Regiment. The Essex Regiment was built in May 1936 and based at Stratford shed servicing the Essex Lines until withdrawn from service in March 1959 and cut up for scrap later that year. The name plate survives and is amongst the memorabilia held by the Essex Regiment Museum at Chelmsford.